The different ways in which we communicate — and don’t — get a real workout in the high-school-lesbian romance First Girl I Loved. 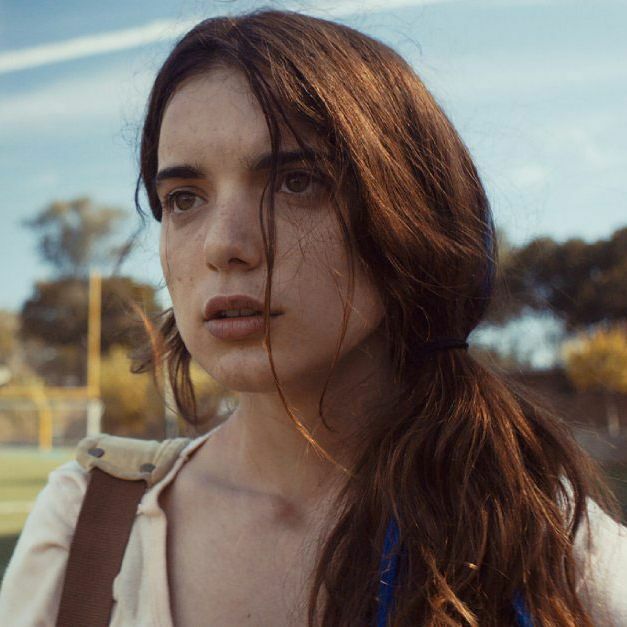 Its central couple is a classic coming-of-age mismatch: Anne (Dylan Gelula, excellent), is a nerdy, gawky (but of course actually quite pretty) yearbook editor, and Sasha (Brianna Hildebrand, similarly excellent) is a softball star. Neither of them quite understands what’s going on: Anne is clearly romantically drawn to her more popular, beautiful classmate, and Sasha finds herself reciprocating, though the question of whether they’re an actual thing is one they themselves dance around. And the way they speak — or, rather, all the ways they “speak” — reflects that. All around these kids swirls a matrix of communication: voice-over, multiple languages, text messages, innuendo, made-up diction, fake accents, even softball signals. Writer-director Kerem Sanga finds stylistic ways to express this diversity of speech. Words gain multiple malleable meanings. During one remarkable passage of scenes, we see Sasha and Anne texting each other, as their voice-overs read the messages for the audience’s benefit. Then we see Sasha at her game, communicating with her coach via hand signals, which are subtitled onscreen. Then we see Sasha and Anne, later that night, texting again, only this time there are no voice-overs; we just see the words on their phones, accompanied by the quiet whomp of their notifications. But then, as the girls become more intimate, the phone sounds go away, and the words take over the screen. Anne sends Sasha a song; the girl puts on the headphones, and we only hear snatches of it. All language, it seems, is flexible — both in the world of the film and in how it communicates with its audience. And some things are hard to put into words. Sanga jumps around in time, abandoning pivotal scenes and then returning to them later to provide additional information. Anne and her onetime best friend, Clifton (Mateo Arias), have a conversation about Sasha early on in the film, and Sanga cuts out of it at key points; when he comes back to the scene later, in drips, we learn startling new things about Anne and Clifton’s relationship. This is a manipulative way to tell a story, to be sure — withholding key details that in some cases the characters themselves are already aware of is a familiar let’s-create-tension-where-there-isn’t-any cinematic trick — but it’s a pointed, appropriate one in terms of this film’s overall effect. The way the narrative starts and stops and doubles back mirrors the characters’ own confusion. We try to make sense of the story along with them — who did what, said what, when, and what did it really mean.